At my school we host two open houses each year. The first is right when school starts and it's a chance for teachers to share curriculum and classroom expectations with the parents. 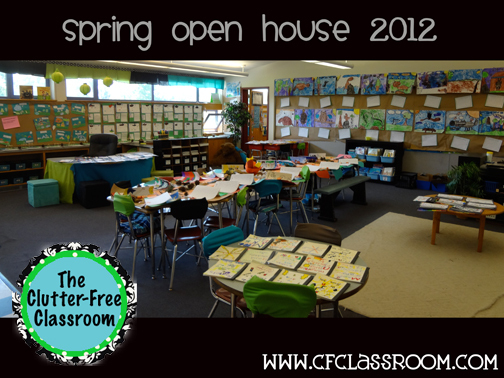 The second is in the spring and is a showcase of student work. As you know, I love me a theme. Therefore it should come as no surprise that I like to get my theme on when it comes to this event. In the past I have done a Hollywood theme, a Wizard of Oz theme, a Fairy Tale theme, and a Charlotte's Web theme. I'll scour the old computer and try to find some pictures from those evenings to share. 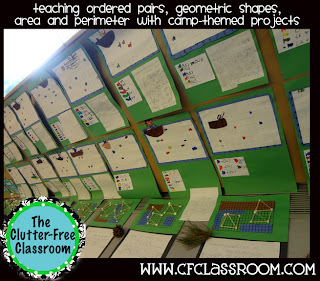 I mentioned yesterday that I'd created a "Math Camp" collection of centers and activities to review all of the number sense strands with my class before the statewide math assessment. 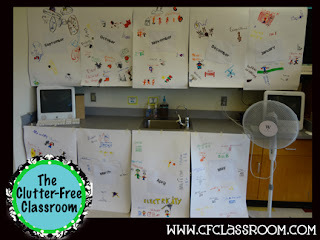 I also came up with some "craftivities" for them to make to practice/reinforce additional math skills. The kiddos were so into it that we decided to carry the theme into our Open House night. One of my little men brought in a big bag of pine needles and pinecones for ambiance. We sprinkled them around the projects. And now I invite you to come on in for my virtual open house. I'll show you around. This was the scene upon entering the classroom. 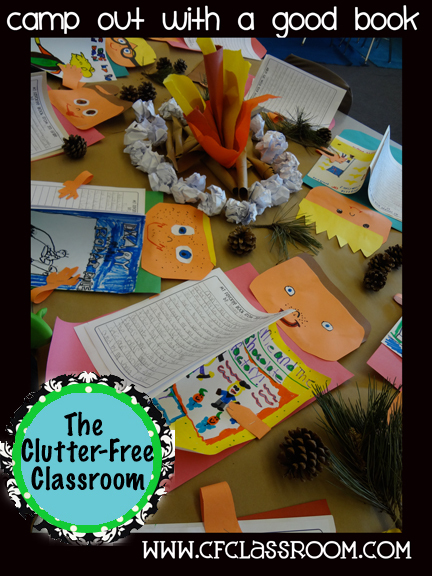 I covered all of my usual displays with brown craft paper to "neutralize" the room and hot glued all of their work directly onto it. I moved tables around so that all "like-products" could be displayed together. I used to place each child's collection of work at his/her seat, but I prefer this method as I feel it makes people circulate more and look at everything. I almost wept with joy when I edited the writing for their animal research projects. 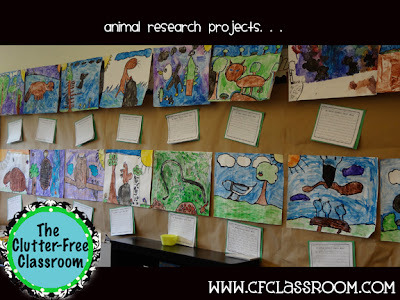 I had given them the criteria, questions and graphic organizers from my animal research packet and guided them in the right direction with bookmarked websites (National Geographic Kids rocks for this) and books, but essentially the work was done completely independently. I was so proud of how well they did on their own. In keeping with the camping theme, each student selected a different woodlands animal to research. The project culminated with a watercolor painting. I do a variation of this project each year....a "self-portrait" of each student "holding" a book with a book report of their favorite story from third grade. They could either select a text they read on their own or one I did for read aloud, but it had to have been from the current school year. Roald Dahl was a favorite. No shocker there. This year I put a spin on the project by having their little people reading in sleeping bags by the campfire. This picture shows our ordered pairs fishing scenes. 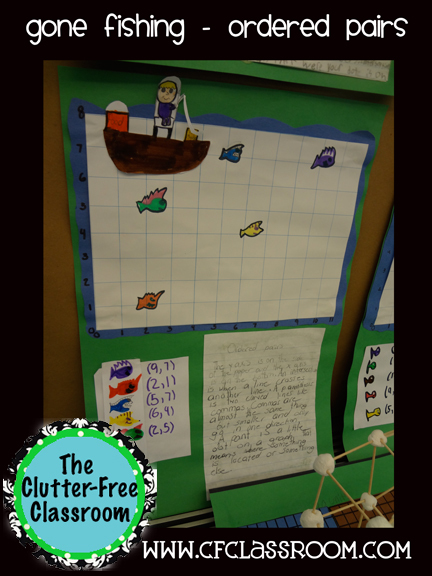 The students plotted fish, recorded their coordinates, and wrote about what they know about ordered pairs. It was one of my kiddo's idea to add the fishing boat. Super cute. We lined the counter with another fun project. Each student used colored grids to create a campground and measure the area and perimeter of their campsite (green), pond/lake (blue) and hiking trails (brown). We then made "toothpick" tents as part of a geometry project and then the students wrote about everything they knew regarding area and perimeter. 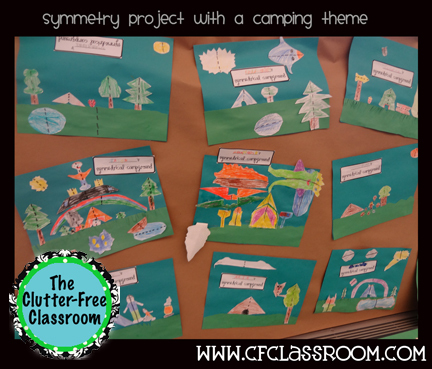 These cute pictures are camping scenes with symmetrical images. They each drew shapes to create a scene and used Sharpies to draw in the line of symmetry. 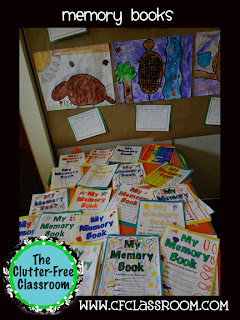 I usually save the memory books for the last week of school, but I had them get started on them for Open House. 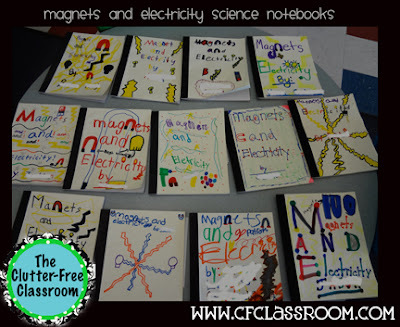 They did the pages about their favorite topic and subject as well as what they did in each of their specials (gym, art, music, computer lab). The memory book packet has over 35 pages so we'll continue to work on them for the next few weeks and add in letters from each student as well as a photo scrapbook. 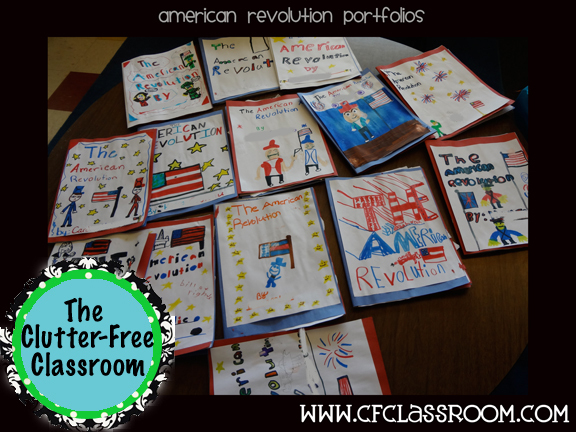 We studied the American Revolution and each student created a portfolio along the way. At the last minute we made posters that highlighted the events of the year. Each panel is a month and they worked in teams to label and illustrate all they we've done (including field trips, performances, cultural enrichment, special events, topics, read alouds, etc. )...We've been busy, busy, busy!